You won’t be surprised to hear there is another UFC event this weekend. Saturday September 3rd sees the UFC return to Germany—making its promotional debut in Hamburg following stints in Berlin, Cologne and Oberhausen. Like with any show debuting in a new market, Saturday night’s card is strong enough to make a big impact on the area. Taking place at Hamburg’s Barclaycard Arena, UFC Fight Night: Arlovski vs. Barnett, otherwise known as UFC Fight Night 93, is headlined by Belarusian Andrei Arlovski.and Josh Barnett in an important all-heavyweight clash. Further down the card, giant European light heavyweight names Alexander Gustafsson and Jan Blachowicz face off as the co-main event, while Swedish scrapper Ilir Latifi takes on Ryan Bader in another intriguing bout at 205lbs with both contests having huge implications on their division. However, one bout that stands out in particular is the Germany vs. UK welterweight clash between Jessin “Abacus” Ayari and “Judo” Jim Wallhead—two big-name UFC debutants with good reputations to uphold for their respective countries. Ayari was originally slated to face Norwegian starlet and Fightland favourite Emil Weber-Meek. But, the conqueror of Rousimar Palhares opted to pull out of the fight with Ayari due to receiving medical treatment prior to signing with the UFC—treatment which could have been at odds with the UFC-accredited US Anti-Doping Agency (USADA). In Meek’s place, the UFC have finally called upon the services of one of Britain’s long-time best welterweights in Wallhead. It’s been a long time coming for Wallhead—an elder statesman of the British MMA scene. A 38-fight veteran with a record of 29-9, Loughborough’s Wallhead has competed in top promotions Bellator, Cage Warriros, BAMMA and KSW. But, the UFC call-up has long eluded him. That hasn’t stopped the former Rough House Gym staple, who trained alongside Dan Hardy and Paul Daley for a number of years, from competing against UFC veterans throughout his career, though. Wallhead boasts wins over the likes of Frank Trigg, Che Mills, Igor Araujo, Jason Tan and Matt Veach. Wallhead has looked stellar since switching camps to London Shootfighters. Training alongside Bellator’s enigmatic Michael “Venom” Page, who will be cornering “Judo” Jim on Saturday night, the man from the Midlands will be walking into the Octagon on a four-fight win streak – three of which coming by knockout including his spectacular effort against Brazilian Rodrigo Ribeiro. The youthful Ayari is enjoying a similar vein of form which attracted UFC matchmaker (for now), Joe Silva. With a record of 15-3, the 24-year-old Nuremburg, Germany, native is riding a six-fight win streak, with his last victory coming against another UFC veteran in France’s Michael Lebout. With such experience which belies his 24 years, Ayari is particularly excited to fight a veteran of the European MMA scene on the big stage. Bearing in mind he was a late replacement, Wallhead proves to be a top stand-in for Meek. "I've always said I want a strong opponent for my UFC debut,” Ayari told GNP1.de. Both men enjoy taking the fight result out of the judges’ incompetent hands. Wallhead has 11 knockouts and 10 submission wins to his credit, while Ayari three knockouts and eight submission wins to his name. 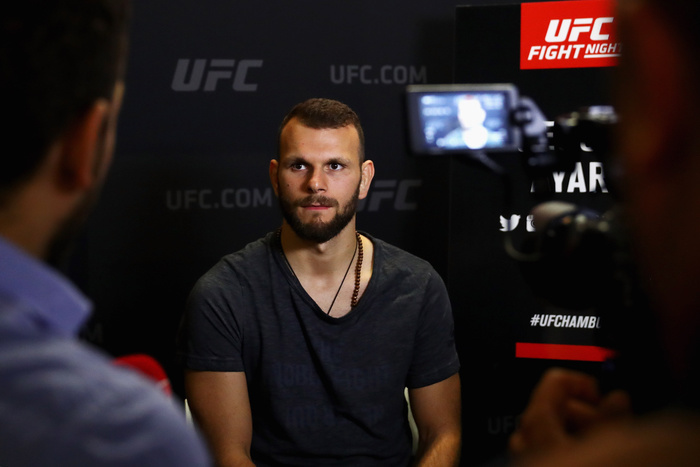 Ayari is an emerging character on the European MMA scene and is sure to have plenty of support on Saturday night in his home country. However, the intrigue surrounding the overdue UFC debut of Wallhead is sure to attract some big viewing figures across the continent.